I find this quote rather fitting considering the response from the election. People were shocked last Tuesday by the results, and judging from my Facebook feed, the shock has turned into anger for some of my friends. Rioting in protest of the results continues, and people are openly talking about how obstructionist the Republicans were for the last 8 years, and "don't expect us to be different because now your guy won." This is the world we live in today, and I hope people realize that 4 years of obstruction will only continue to anger the people who voted for a perceived "real change" in the first place. During the midterms, 34 seats in the US Senate will be contested, 26 held by Democrats and one Democrat claiming to be Independent (the famous / infamous Bernie Sanders). Some of those seats are in Red or Red leaning states. I think the Democrats have a more difficult climb to retake the Senate than the Republicans do to keep it. 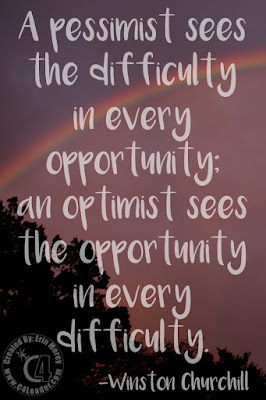 So instead of finding the difficulty, find the opportunity. I would encourage both sides to be better, open dialogues, and start working toward solutions to the problems of the country. If we don't I think a bigger divide will grow, increasing strife and generating real hate. We were founded by men and women who left what they knew to avoid oppression and start fresh. It was an amazing opportunity, which everyone arriving knew would be difficult. And even though this quote comes centuries later, the American people can display this resolve again. Look for the opportunity in the difficulty. Solve problems, rather than obstruct. Start conversations with people who don't agree with you, not to prove them wrong but to first understand. When you understand, then perhaps you can help them understand you. Be the optimist.